This tracker comes with a FREE tracking website. The X series are the latest GPRS trackers (no DTMF feature) with new functions, such as, user can program (set up APN, port, interval, dial back tele#, etc. ), control the tracker (fuel cutting, sleep mode, etc.) from our GPRS tracking platform. User can also update the new firmware any time from that there. The tracker’s current set-up status list can also be viewed from there. Beside the program over-the-air functions, user can also set up the tracker from a PC with the USB cable or by SMS from any mobile phone. The new ” X ” series can also send the real time position to the set up dial-back telephone numbers with a www hyperlink. 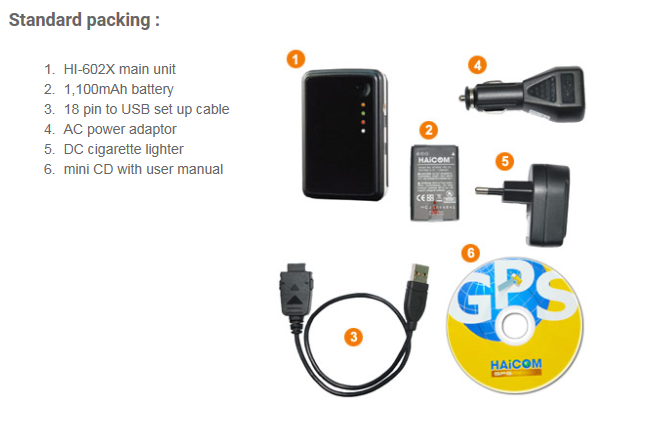 Using the Haicom Tracking App the user can check the real time location from the smartphone with a position on the map. Inside the tracker, there is flash memory which allow the tracker to keep recording the positions (as a data logger function) so that user can view the tracker’s whole trip even when there is no GSM network coverage. With the inclusive Haicom Tracking software, the user can view the history position data on the user friendly map. Also, with the built-in motion sensor, user can set up the tracker to go into sleep mode actively or passively to save the tracker’s power consumption. The HI-602x is a very small (43 x 69 x 18mm) GPS / GSM / GPRS tracker. 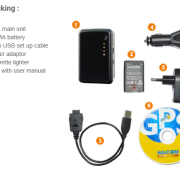 Inside the tracker, there are mainly contain: GPS module, GSM module, GPS antenna, GSM antenna, re-chargeable battery and it is an independent device similar to a regular mobile phone and completely self-contained. It uses the most user-friendly program over-the-air technology via GPRS data transfer to send back the GPS location data directly to another phone and user can track any moving object live on the map free of charge from our GPRS web tracking platform. With a simple SMS command from any phone, user can easily get the tracker real time data back from anywhere. With HI-602X multi function gps tracker, one can track, remote control, track any object globally in real time on the map. 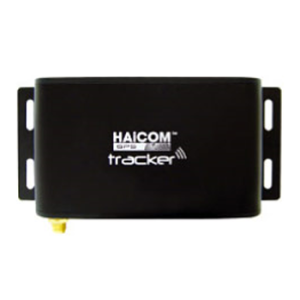 User can check the real time location from the GPRS tracking web site or by using the Haicom Tracking software installed on the PC and check the real time position on the map. 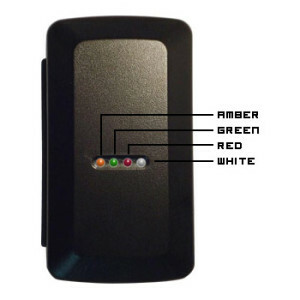 HI-602X gps tracking Device is the best tracking solution for use in the widest range of applications, from motor homes to mobile homes, from cars to caravans, from agricultural machinery to construction equipment, from containers to golf carts – all the assets that you feel could be at risk, especially if they do not have their own source of power. Just place the tracker in the asset, user can see his asset anytime, anywhere from any computer. The built-in battery provides independent power supply even if there is no external power supply. The moving sensor will let the tracker totally switch off (only the microchip standby: 2 mAh) and the tracker can operate very long, if there is not much movements. With the moving sensor, the tracker will not drain the car battery when the tracker connected to external battery power. It is also a very good personal security device for children and old people. After purchasing, one can use any local GPRS enabled SIM card (or pre-paid SIM card, etc.) By adjusting the GPRS sending interval one can control the cost of SMS messages it sends. By setting up to 3 call-back telephone numbers in the HI-602X, one can press the SOS button and the tracker will immediately send the SMS with GPS location to the preset telephone numbers. User can also press the Geo fencing button so that the tracker will send the SMS warning when the tracker out of the preset circle area. The Geo fencing is also very useful for security purpose to restrict your vehicle, moving property movement. For instance, the tracker will automatically inform you with SMS when your car is out of the preset area circle. 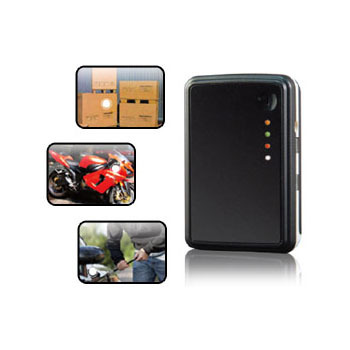 User can also connect hi-602x to all kinds of optional car kits accessories so that the user can globally control the vehicle’s fuel supply or power by pressing a few phone buttons from any phone. For example, by connecting the optional vibration sensor, the tracker will also actively warn you when there is any movement of the vehicle. Personal tracking, employee, teens, spouse, fleet, etc. Worldwide coverage with NO additional programs to buy or install – no additional or hidden costs! Provides 24/7 access to location of all your assets. LIVE real-time tracking, configurable from every 20 second to 72 hour GPRS updates! Assets are sitting around in one place, when they start moving / stop moving etc. Establish how long the assets are being used (actual operations time). Warns when unauthorised / unwanted movement happens. Enables the recovery of any stolen assets.